From brief instructions , I made this green screen tote bag today. Cute, eh? I love sewing small projects. Many of the projects I make have velcro closures. One thing that bugs me is to see a stitching line on the outside of a project where a piece of velcro is stitched on the other side. In an attempt to hide those velcro stitching lines, I look for ways to stitch the velcro on, without using the obvious little square stitching line. Here are a couple of examples. I added lines of stitching to make it seem decorative here. I basted down the velcro on the under side with white thread. Then sewed an all over design on the right side. Then removed the white basting thread. Do you have innovative ways to hide the traditional way of stitching on velcro fasteners? PS: I know some will ask....The first project is needle case by Nancy Halvorsen's Sew Necessary book. The second bag is the Sassy Bag, by Lazy Girl Designs. Last week, I was invited by the Grade 4 teachers at my grandchildren's school, to give a presentation on our recent trip to China. I gladly accepted and delivered my presentation last Wednesday morning. There were about 50 kids in the two classes. My one hour presentation included about 150 pictures and a few videos of things that I thought would be interesting to the kids. Thinks like The Great Wall of China, the panda bears and other animals at the zoo, the lucky dragon, and many pictures of food and candy. And we ended the presentation with a little hands on using chopsticks and eating a cracker snack from China as they headed out to recess.. The presentation went really well and the kids had many questions... like... What was on the other side of the Great Wall? Well, I was surprised on Friday, when the teacher when sent home a bunch of thank you notes that the kids made for me. I was truly touched, and love the effort. His favorite part was using the chopsticks. Dragons are lucky in China. See the lovely drawing of the Great Wall. I showed them using a globe, how we flew over the North Pole to get to China. I had many pictures of the Great Wall. They liked that. It is one of the Great Wonders of the World. I think Avery liked it. I've been working on small projects lately. The other week I showed you a sandwich/snack bag prototype, and to go along with them, I'm making reusable sandwich wraps for the kiddos. I've used cotton on one side, and nylon on the other side. And a simple strip of velcro holds the wrap closed. When the sandwich is wraped up, it makes a nice package. The wrap also serves as a placemat when it's opened. Then when their lunch is done, they simply shake the crumbs out, and fold up the wrap and stick it back in their lunch bag. Their mothers can throw them in the laundry when they get home. I finished up 10 of them today. I'll call them prototypes for now... The 5 kids can each test them for the rest of the school year, and give me feedback. If they like them I'll make more for them in the fall. Aurora's favorite movie is Free Willy. She has watched it at least twenty times. I've heard her mutter time and time again, "I wish I had a locket like Kira." Kira is the little girl and main actress in the latest Free Willy movie. She was key to helping Willy find his family pod of Orca Whales. Today Aurora got her locket. She put a picture of her mom and her in it. She loved her surprise locket and looked at it all afternoon. She demonstrated for us how Kira holds the locket to remember her mother. Did you ever have a locket when you were a kid? I don't remember if I did, but if I did, I would have loved it too! Lady Slippers in my woods. They are such a unique flower. I had no idea until my friend Linda H. told me they are rare. She came to see them with her own eyes. While I took these pictures, Linda took stunning photos. She shows them and has a great explanation of these beauties, go to visit Linda's Wildflower Wednesday post here. Pink Lady Slippers - Patch 4 - notice the seed pod. It might be from last year. Pink Lady Slppers - Patch 3 - notice the seed pod stick from last year. Are you a Smartphone Quilter? My new HTC One V beside an IPhone case. Well, for a while now, I've been pondering upgrading my cellphone to a smart phone style phone. Since we got home from China in late April, I've been reading about various smart phone technologies, and studying the various carrier plans. What I found it, is that buying a smart phone is all about what your needs are. There are many different phones and plans. I read this mobilesyrup.ca blog/website daily to get a feel for what's happening in the mobile industry in Canada. There are updates and news several times a day. My main needs were very specific. I want to be able to occasionally check my email and Internet from our cottage. Our phoneless, wireless-less cottage. When cottage season is over, I want to scale back my data plan and not have to be stuck in a contract to pay the monthly fee for services that I don't want to use from October - May. All my other cell needs are minor. 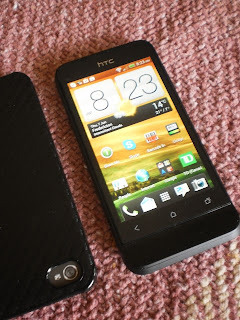 After my research, I settled on this HTC One V phone. I had never even heard of HTC before starting my research. My new One V is about the same size as an IPhone. See it beside an IPhone case. I've also decided to stick with carrier Koodo. I've had excellent service from them in the past three years with my regular cell. Now that I've had my phone for a week, I have learned something new every day on it and I'm ready to test it out at the cottage this weekend. I've downloaded a few apps, but nothing too terribly interesting. Bejeweled, and Suduko..
What I really want to know, is, how can this smartphone help me with my sewing and quilting projects. If you are a Smartphone Quilter, I'd love to know how it helps you. I'm testing my new smartphone. It takes a nice picture. It's been 10 months since I started hand-stitching this project. For about 6 of those months, I have to admit, that it sat on the coffee table without any work done on it. So now that I'm on a roll again, my next step is to add an inner border, then make piece the individual blocks in the border. Just in case you want to do this project using DMC 12 wt Perle cotton, this is what is left from two spools. About two needles full. Whew, that was close. There maybe just enough to stitch a label. I really like this Perle. Much better than two strands of floss, in my humble opinion. Now, on to the borders... Stay Tuned..